CG Killarney proved to strong for Ballyheigue on Sunday to advance to the last 16 of the Dominos Pizza Reserve Cup . John Foley scored a hat trick for CG Killarney with Joe Donovan scoring twice before Darragh O’Regan came out field after keeping a clean sheet to score the goal of the game with a stunning strike. Jason Griffin was the Ballyheigue Athletic goal scorer. QPR are into the last 16 after they defeated Mitchels Avenue on Sunday morning. Mark Reen scored twice for QPR with Shane Reen and Paul Cooney getting one each. Chris O’Sullivan was the Mitchels Avenue scorer. Classic Fc also booked their place in the third round with a win against CSKA Tralee on Sunday evening . Shane Fitzgerald scored twice for Classic Fc with Brendan Sweeney , Eoin Colgan and Wayne Murphy getting one each. Ballyheigue Athletic 1-6 CG Killarney . Mitchels Avenue 1-4 QPR . CSKA Tralee 1-5 Classic Fc . 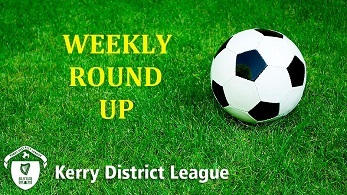 Friday night saw the only two undefeated sides in the Division clash in Mounthawk Park. Ryan Dolan gave Fenit Samphires a first half lead but two goals in the second half from Sean Fitzgerald put Dingle Bay Rovers ahead. Bill Mullins levelled the game against with a low strike from distance in the 92nd minute. Killarney Celtic Came from two goals down early on the defeat St Brendans Park Fc on Sunday morning in Celtic Park . Fergal Maunsel and Mike Conway had the Park two up within ten minutes but were dragged back with goals from Peter McCarthy and Joe Hurley. Mark O’Sullivan Maunsel put the Park ahead before the break and this was added to when Con Barrett headed home in the second half to put the Park 4-2 up. Peter McCarthy scored his second before Stephen Hayes levelled the game midway through the second half. The winning goal in a terrific game once again came from young Stephen McCarthy who is making a habit of scoring important goals this season for Killarney Celtic. Reigning Champions Tralee Dynamos are up to fourth place with a win at home against Listowel Celtic on Sunday morning. John Farragher scored twice for Tralee Dynamos with Anthony Murphy, Maurice O’Rahilly and Shane Guthrie getting one each . Mike Woods and Joe Joe Grimes were the Listowel Celtic scorers. Dingle Bay Rovers 2-2 Fenit Samphires . Killarney Celtic 5-4 St Brendans Park . Tralee Dynamos 5-2 Listowel Celtic . Rattoo Rovers are up to fifth after a win away against Killorglin on Sunday evening. Aidan Boyle, Liam Boyle , Eddie Joy and Brian Carroll were the Rattoo Rovers goal scorers. Killorglin Fc 0-4 Rattoo Rovers . AC Athletic have moved to the top of the division with a win at home against Killarney Athletic B on Sunday afternoon. John Buckley scored a hat trick for AC Athletic with Joseph Diggins getting one which makes it his tenth goal of the season. AC Athletic 4-0 Killarney Athletic B .
AC Athletic B team and Classic Fc B couldn’t be separated on Monday night in Mounthawk Park . Paul O’Grady scored for AC Athletic with Jay O’Sullivan scoring for Classic Fc B.
AC Athletic B 1-1 Classic Fc B .
Tralee Bay Fc and CS Abbeydorney could find a way to get the better of each other on Sunday morning in Mounthawk Park. Peter Williams and Shane Carroll scored for Tralee Bay Fc while Eoghan Dillane and Gearoid McCarthy scored for CS Abbeydorney. Tralee Bay Fc 2-2 CS Abbeydorney . Classic Fc picked up their first win in this seasons New Yorkers Over 35 league. Johnny McCarthy scored both goals for Classic Fc with Donald Bennett scoring for AC Athletic. Classic Fc 2-1 AC Athletic . Ballylongford Fc and AC Athletic had to share the spoils after a six goal thriller on Saturday afternoon. Darragh Goulding scored twice for AC Athletic with Gerard Leen getting one. Ballylongford Fc 3-3 AC Athletic . © 2016 Kerry District League.